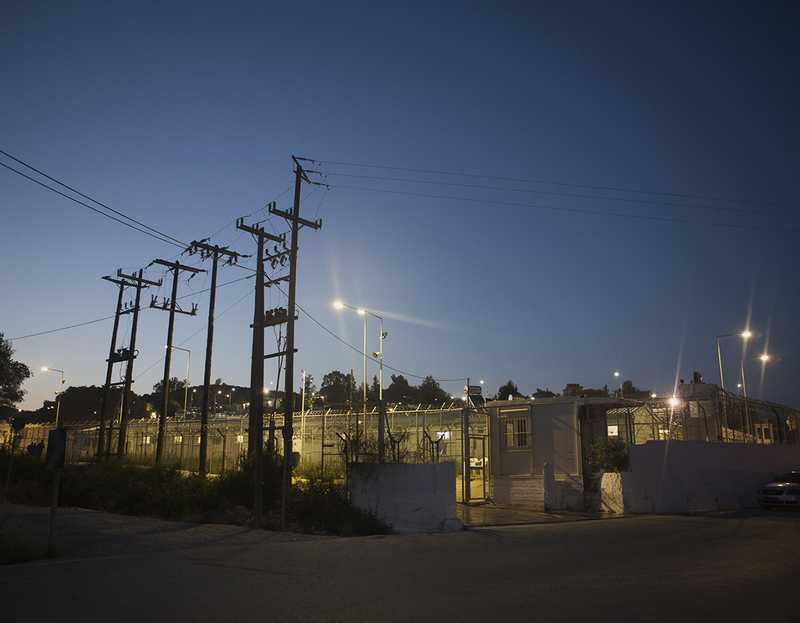 Moria Camp in Lesbos, Greece. Business is brisk at the Kerimis food truck opposite the Moria detention camp on the island of Lesbos, Greece. A non-stop stream of volunteers, policemen, Non-Governmental Organizations’ staff, journalists, tourists and residents of the camp queue to buy food, snacks, ice cream as well as cans of fake and genuine Coca Cola, all at regulated prices. Stratos, a former owner of a courier company that went bankrupt and his trained graphic designer wife Efi, who have both lost their job, opened this truck a couple of months ago on the land they own right by the camp. The handful of tables in front of their truck where customers can sit and enjoy their food is the most incongruous meeting place. Apart from the food and drinks, the other attractions include electric plugs where customers can charge their mobile phone free of charge. This comes in handy since part of the camp, which hosts up to 4000 asylum seekers, does not have electricity. This is where we meet Z. Junior and DHL, two asylum seekers from Cameroun. This is the first time they venture out of the camp since they arrived ten days ago. After waiting out winter in Istanbul for two months they crossed the short but treacherous channel between East Turkey and Greece. They do not even know where they crossed from. All they know is that they paid 1500 euros to be driven from Istanbul to the coast where they had to wait by the beach until their passer estimated the time was suitable to attempt the crossing. Steering of the dingy was entrusted to a Pakistani “because he used to drive a mop in Pakistan” specifies Z. Junior. The only recommendation that the skipper was given was “to avoid the Turkish radar and to head to the red lights of Lesbos”. Unfortunately for them, Z. Junior and DHL arrived after the fatidic date of March 20th, as of which according to a controversial agreement between the EU and Turkey, migrants who have already reached the Greek islands are returned to Turkey from where their resettlement to European countries or their repatriation is to be processed. “Nous sommes des malchanceux (we are unlucky ones),” deplores Z. Junior in perfect French. He hopes to make it to Switzerland where his sister has been living for the past 14 years and where he hopes to study medicine. DHL, a trained electrician, wants to seek asylum in Germany. Both lived in extreme poverty in Cameroun and dream of a better life in Europe. They describe the conditions in the camp as appalling. They sleep on the floor, food is scarce and hard to obtain because of the long queue, violence is rife, hygiene is low and anxiety prevails. They are intently waiting for their “free camp”, a document which will allow them to move freely around the island but not to leave it. They hope they will not be deported back to Turkey and swear that should this happen, they will try again to enter Europe by whichever other possible route. Their determination is unnerving. Both devoted Christians, they say they have put their destiny in the hands of God. 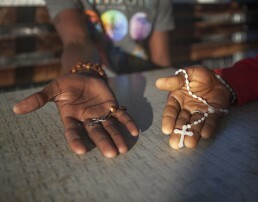 Zang and DHL from Cameroon and residents at the Moria camp in Lesbos are showing their crucifix as a symbol of their faith.